The Trump administration should disband an Obama-era board that aims to emphasize the role of racial identity in government policy, a paper released by the Heritage Foundation Wednesday argues. Heritage Foundation scholar Mike Gonzalez argued in the new policy brief that President Donald Trump should take aim at the National Advisory Committee on Racial, Ethnic, and Other Populations. The NAC, as it is called, provides advisory input to the U.S. Census Bureau on matters pertaining to ethnic identity. The NAC was re-chartered in its current form in 2012, under then-President Barack Obama, although various advisory bodies on racial and ethnic matters have existed within the Census Bureau since the 1970s. The Bureau calls the NAC "an important channel of communication between the Census Bureau and race, ethnic, and other communities." These "race, ethnic, and other communities" consist largely of various interest groups claiming to speak for ethnic or racial groups as a whole, but in reality representing only the academic and activist left, Gonzalez argues in his paper. Four of the NAC's 31 filled seats are held by organizations that "tilt decidedly to the left"—Asian Americans Advancing Justice (AAJC), the Mexican-American Legal Defense and Education Fund (MALDEF), the National Association of Latino Elected Officials (NALEO), and the National Urban League. An additional 10 member groups, "represent organizations devoted to ethnic or sexual identity groups" while "the other 17 members are mostly academics involved in the left-wing fields of ethnic studies, critical race theory, and multiculturalism," Gonzalez writes. The effective consequence of this composition is a uniformly left lean to the NAC's public pronouncements. 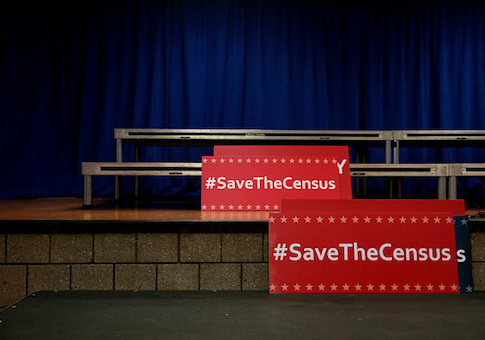 For example, the board unanimously condemned President Trump's plan to add a citizenship-status question to the 2020 census, even though the question appears on the annual, Census-Bureau administered American Community Survey and Current Population Survey. "When we look at accessing federal, you know, any types of federal support, for example, we lose out dramatically because we don't have a separated category. … [B]ecause we are quote ‘white,' we are not seen as a priority area for city or state or federal funding," Gonzalez cites Sarsour as having said at a Census Bureau meeting in 2015. Gonzalez ties the current instantiation of the NAC back to a larger effort by activist groups to concretize racial categories in the census, starting in the 1970s and 1980s, for what he contends are similar reasons. This, Gonzalez argues, departs from the nation's founding Lockean vision, substituting color-blind justice for a competition for resources among racially divided stakeholders. However, there is a way for the Trump administration to disempower this board. Under the terms of the NAC's re-chartering, the body exists at the discretion of Secretary of Commerce Wilbur Ross. With the stroke of a pen, Ross can terminate the body, adding it to the numerous extraneous advisory boards already dumped by the Trump White House. "Special identity pressure organizations should not enjoy special access and disproportionate influence via the NAC. Instead, they can present their positions like everyone else. Secretary Ross should terminate the NAC's authority and disband it," Gonzalez wrote.